My Brother DCP-J125 is not printing in magenta or yellow. Can you help? - Remove the two offending cartridges and switch the printer off for five minutes. Blot the cartridges on some tissue paper to check that the ink is flowing. Once you've reinstalled the cartridges, run a cleaning cycle on the printer. This will remove any dried ink that could be blocking the contacts. If you're still having the same problems when you're printing it might be a fault with the cartridges and I would recommend contacting the supplier of the cartridges for more assistance. 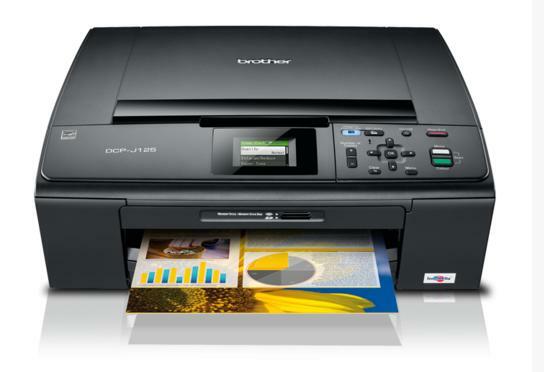 Compared to other multifunction printers from the same range, the Brother DCP-J125 offers better value for money with affordable inks and a good selection of facilities, making it efficient for the home office and amateur photographers. The DCP-J125 is an all-in-one device which is praised for having media slots, which makes direct printing possible from memory cards. However, discerning users with an eye for high-quality photographs should look elsewhere. This 6.8kg multifunction device boasts a sleek and stylish design with a compact 15.4-inch, 5.9-inch tall, and 14.5-inch frame. Its centrepiece is the 1.0-inch LCD colour screen in the heart of the control panel with minimal buttons for ease of use. There are built-in media card slots for direct-printing convenience. The flatbed scanner and copier occupy most of the top area of the Brother DCP-J125. The Brother DCP-J125 inkjet printer is good for students and home users who love to print pictures directly from media card slots or digital cameras. The flatbed scanner and copier can accommodate thicker media and odd-sized objects. The 4-ink cartridge system of the Brother DCPJ125 printer makes it cheaper to run, and the Energy Star-qualification adds to better value for the money. Photo output is not very impressive. The Brother DCP-J125's print speeds are inconsistent and not at par with the manufacturer's claims of 33ppm in monochrome and 27ppm in colour. Paper input is limited to 100 sheets only. The Brother DCP J125 multifunction printer cannot be shared by a network with the absence of Wi-Fi and built-in Ethernet ports. Users might find the display screen too small for previewing pictures.